Yep, it sounds totally stupid, unless you are an Oklahoma University football fan and bleed red. And the fight song? The one that says “Boomer Sooner” about eleventy gillion times? Totally stupid. Unless you are, and I quote, “Sooner born and Sooner bred and when I die I’ll be Sooner dead.” In which case, it rocks. And as I type this and sing it in my head, punctuated by KA-BOOMS fired by the OU Ruf/Neks, I am flooded with memories. How many Friday nights and Saturday afternoons did I spend at Owen’s Stadium? About a million. 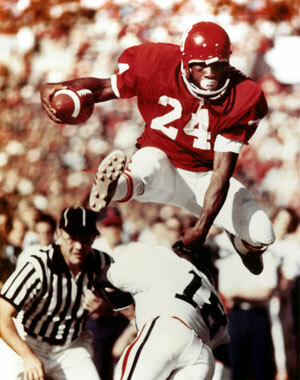 As I finalize this blog post, OU, the ONLY Big Red, is playing Nebraska, a team I grew up hating, fearing and respecting, especially in ’71 (the black-shirted bastards). The 4th quarter just ended in this, the last conference meeting ever between the Sooners and Huskers. OU 23 – Nebraska 20. Only one thing to say about that, even from New Zealand. Remember to go here for Hog Tweets. You know I love when you tell stories from your past. I have never been particularly tied emotionally to any football team except for one year. I was 15 and in the pep band and the marching band at Whitehall High School. A long time ago. We played and marched at every home game. So dorky, I know. The bitter cold? The smell of hotdogs and popcorn? The sense of connectedness to a sports team? To the athletes? That’s the only time I ever felt that way. And I love your stories of the past. My favorite so far – Boomer Sooner!!! And you would not be biased AT ALL, eh? I think your very first night-shirt was Soonerwear! God I love Owen Field!!! Soooooooooooooooooooo many memories… Some not printable at all…………….